Industrial rents have stabilised. They were flat q-o-q in 4Q18. We see a bottoming given low supply pipelines for all the sub-segments. The impact of the trade war on industrial fundamentals and supply chains has been negligible so far, with industrial leasing volume jumping 22.2% in 11M18. Demand continues to be skewed towards high-spec properties that are close to infrastructure and transport nodes. According to CBRE, semiconductor, electronics and third-party logistics players contributed to the bulk of leasing demand, led mostly by renewals and in some instances by expansion. We expect rents for newer business parks at city fringes and high-spec properties to firm up further this year, on the back of expansion by technology firms. For one, The Business Times on 17 Jan 2019 reported that Google was in advanced negotiations to nearly double its leasing requirements with an additional 400,000 sf at Alexandra Techopark. There have also been enquiries from co-working operators expanding selectively outside the CBD, according to CBRE. Although vacancy rates climbed from 12.1% to only 12.2% in 4Q18 as demand for older business parks remained weak, we estimate that rents in city-fringe business parks could rise 3% this year. This would be lifted by strong office rents, which have jumped 20.7% from their trough in 2Q17. The above should continue to motivate industrial landlords to embark on AEI or redevelopment. This is especially so since average land tenures for their properties are longer than for new industrial government land sales, where supply has continued to be trimmed. 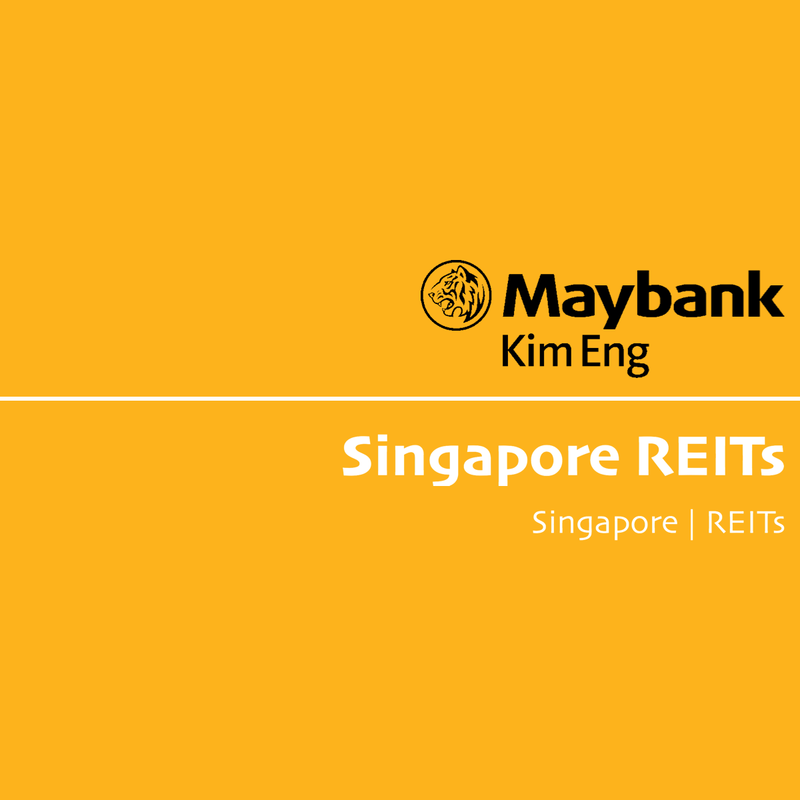 ESR-REIT (SGX:J91U) now ranks as the fourth largest industrial S-REIT with its SGD3.0b AUM, following its merger with recently-delisted VIVA INDUSTRIAL TRUST (SGX:T8B). This stock likely warrants increased investor interest, given its recent sizeable deals and potential redevelopment pipeline. Overseas acquisitions completed in the past 24 months should help to support or raise DPUs in 2019 among the industrial REITs. Our preferred large caps remain ASCENDAS REAL ESTATE INV TRUST (SGX:A17U) and MAPLETREE INDUSTRIAL TRUST (SGX:ME8U), given their clear developed-market growth mandates and debt headroom. ASCENDAS REAL ESTATE INV TRUST (SGX:A17U) is the largest and most liquid S-REIT. Its rising overseas exposure is expected to offset lower Singapore contributions in the near term. We continue to favour its scale and see it as the best proxy for a recovering sector, given its concentrated business-park and high-spec portfolio, which makes up 58% of its AUM. Following its UK entry and a stronger sponsor pipeline after the CAPL-Ascendas Singbridge merger, we see further diversification which could provide upside to our FY19-21E 3.0% DPU CAGR. MAPLETREE INDUSTRIAL TRUST (SGX:ME8U) has visible growth drivers from its AEI at 30A Kallang Place, where pre-commitments jumped q-o-q from 44% to 75% at end-Sep 2018. Its US data-centre acquisitions should also contribute in FY19. 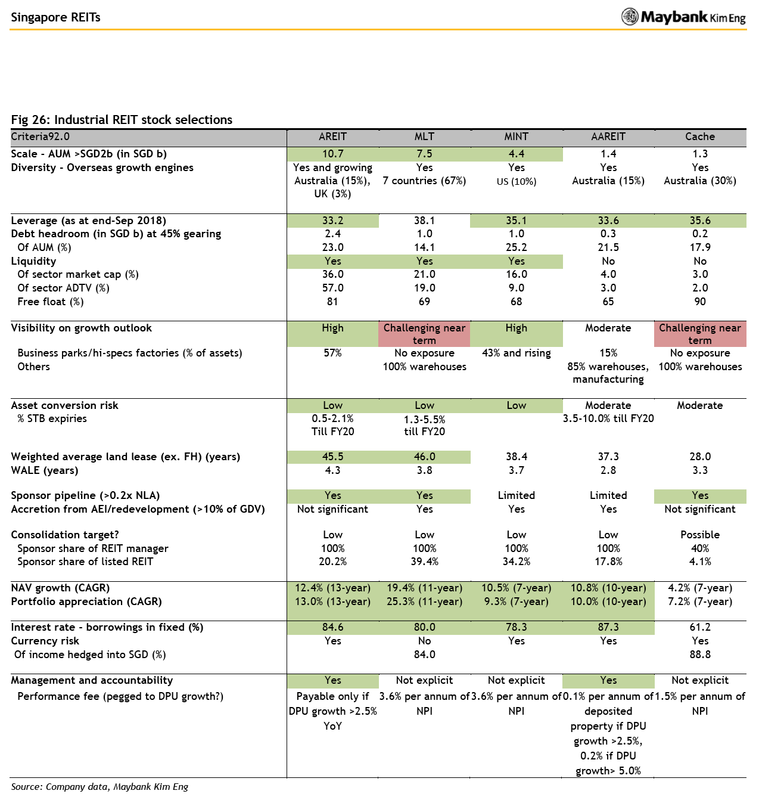 Low 35.1% gearing and clear acquisition-growth potential could provide upside to our 3-year 5.0% DPU CAGR forecast.